If I was to force feed you a rich meat stew at 6 am, followed by a roast chicken an hour later, it’s a definite possibility that your digestive system would rebel AND your energy levels would go into free fall. Similarly, there are reasons we don’t (usually) hit the gym at 3 in the morning, nor do we schedule killer tasks for midnight. 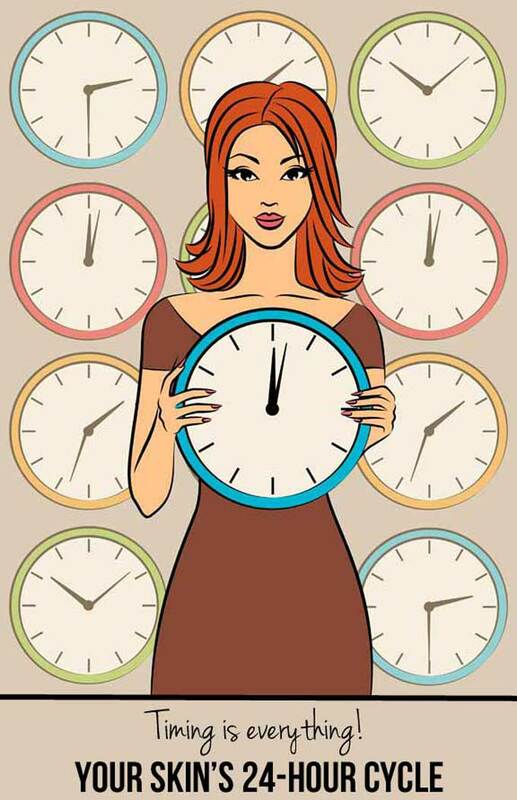 Our bodies have a definite internal clock, which predetermines the best time to do work, eat meals and sleep. And for most of the time, we’ve learnt to understand and respect the same. Unfortunately, we forget that our skin is also a biological entity (in fact, it’s the body’s largest and fastest growing organ) that has a similar internal clock. 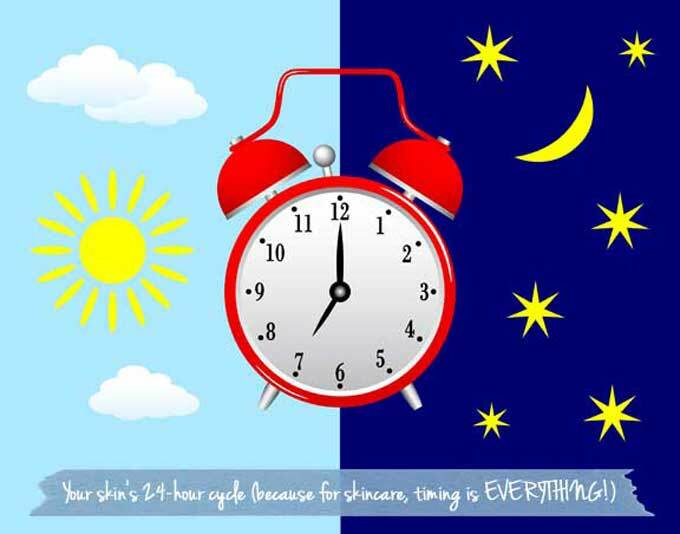 This internal clock determines the best time to moisturize, shave, wax or apply a treatment. There is also a time when skin will be most vulnerable, most oily or most sensitive. 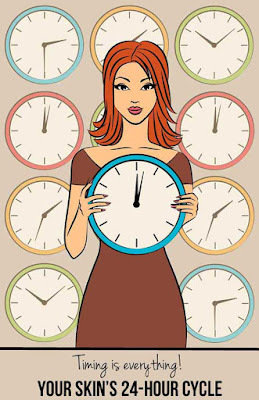 Often, we ignore this skin clock, which may well explain why all those beauty treatments are not delivering on their promise. So don’t ignore your skin’s daily schedule, as that’s what decides the ultimate effectiveness of any product or treatment. Here you have it in a nutshell. This is the prime time for puffiness and creases, as lymphatic fluid pools while you sleep, especially under the eyes. So try a cold compress, apply an eye mask or opt for an eye gel that’s enriched with refreshing botanicals like briar rose, cucumber and chamomile. Skin is at its most sensitive right now, so save the deep cleansing, exfoliating, spot-squeezing and massaging for later; instead keep your morning skin routine simple – cold water, mild cleanser and toner. During this period, our levels of adrenaline (which fight stress) and endorphins (natural painkillers) are highest, making it the perfect time for ouch!-inducing treatments like electrolysis or waxing. Going in for fillers or Botox? Try it during these hours – it’s advisable not to lie down or rub your face for several hours as this could make the serum leak into adjoining areas, causing unevenness and drooping. These are the hours when the skin is at its best and the natural barriers are functioning optimally, making it the best time of the day for exfoliating treatment, including DIY peels and clinical microdermabrasion. However, this also the time when you face peak sun damage. Twenty minutes in the midday sun can cause more skin damage than two hours in the early morning, so reapply the sunscreen. There is a reason behind the dreaded afternoon oil slick: oil producing glands pump out twice as much at this time, compared to the rest of the day. That’s because androgens (male hormones) increase mid-afternoon, making sebum levels rise to peak-production. To foil the shine, soak up the grease with blotting papers, then apply a thin layer of matte translucent powder. These are the most polluted hours of the day, stepping up risk of free radical damage, which can gradually disintegrate skin cells and accelerate the ageing process. Make sure you wear moisturizer that’s spiked with the anti-oxidant vitamins A, C and E.
A study from Manchester Metropolitan University shows that this is the best time to hit the gym: your energy levels are high and muscles and joints are at their warmest, lessening chances of injury. However, avoid having a beauty treatment for at least two hours after the workout, as the rise in body temperature adversely affects the skin’s natural protective barriers, making it extremely sensitive. Blood vessels are at their most dilated now, making us go red most easily. So make sure you use some concealer to spare the blushes. As blood flow to the skin increases and endorphin levels drop considerably, you will also become more aware of pain and irritations such as allergies, insect bites or eczema, so keep some calming lotion at hand. Your face is more receptive in the evening, when skin temperature is higher and the surface layer more porous, allowing for greater penetration of active ingredients. Start by washing away makeup and grime to prevent clogged pores, blackheads, breakouts and lackluster skin, along with providing a clean canvas for treatment products, helping them penetrate faster and work better. Now is the best time to have a warm, relaxing bath and a cleansing facial massage, followed by the heavy-weight treatments. 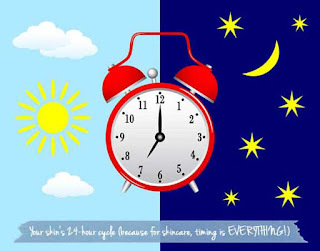 That old adage ‘an hour before midnight is worth three afterwards’ is true; the hormone that triggers sleep – melatonin – peaks at around this time, making 11 pm the hour we should go to bed for maximum skin benefits. But more on this later as it’s a chapter in itself! 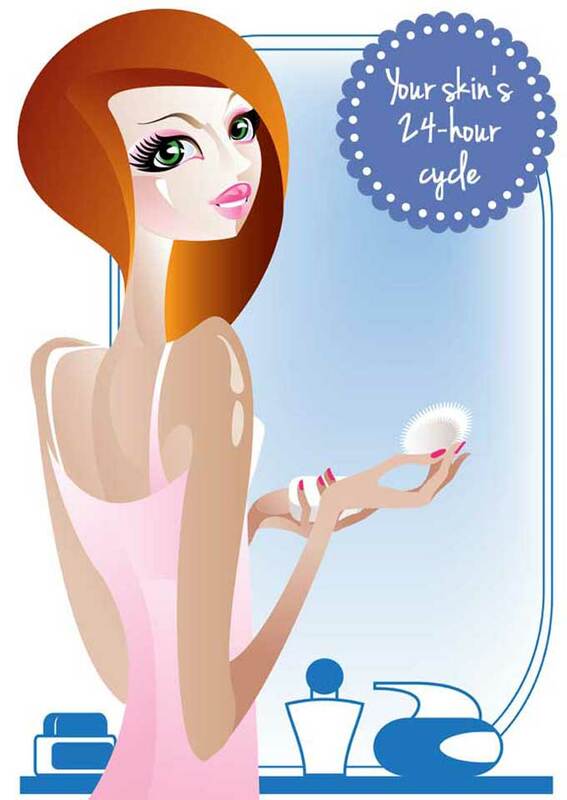 Have you noticed your skin responding to an invisible clock? Let’s talk.